Gates: 'Satya has right background' Jump to media player Microsoft founder Bill Gates says the company's new CEO Satya Nadella "has the right background". Ballmer to retire from Microsoft Jump to media player Microsoft chief executive Steve Ballmer is to retire from the technology giant within the next 12 months. Inside Microsoft's house of the future Jump to media player Microsoft offers BBC News access to its Envisioning Centre, a facility it uses to portray what life might be like five to 10 years in the future. Steve Ballmer: 'I love this company' Jump to media player A look back at some memorable moments of Microsoft chief executive Steve Ballmer's career. Microsoft founder Bill Gates has said he is "very excited" about the choice of Satya Nadella as the firm's new chief executive. Indian-born Mr Nadella is currently Microsoft's head of Cloud and Enterprise, which builds and runs the firm's computing platforms and developer tools. 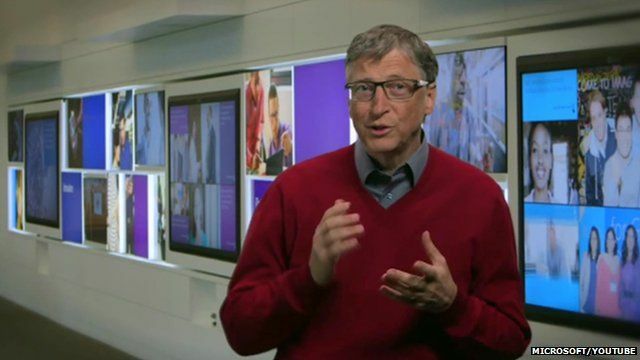 Speaking in a video posted on the firm's YouTube channel, Mr Gates said; "Satya has the right background".